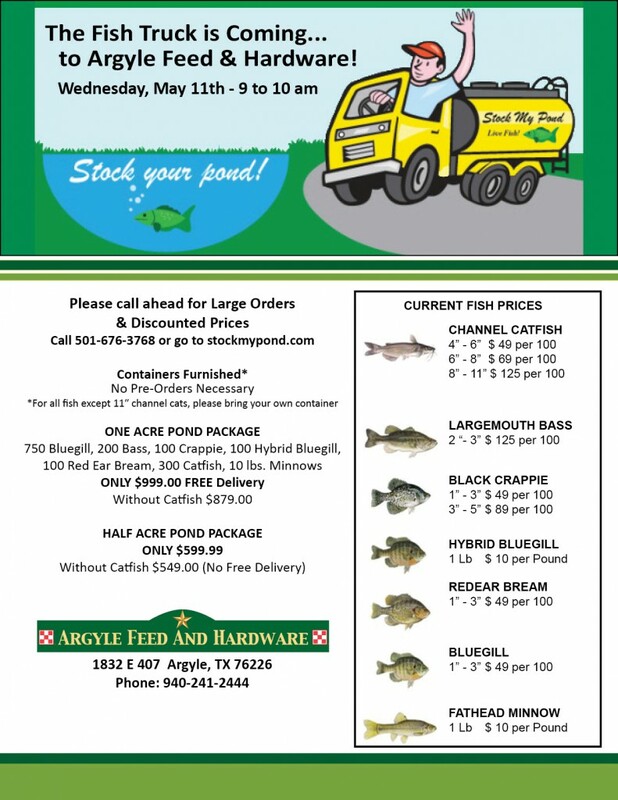 The Stock My Pond fish truck visits Argyle Feed & Hardware on Wednesday, May 11th from 9 to 10 am. Stock My Pond will deliver channel catfish, largemouth bass, black crappie, bluegill, red ear bream and fathead minnows. Containers furnished for all fish purchased except 11 lb. and larger catfish— please bring your own container for transport. See the price list below for individual fish and pond package pricing. We recommend contacting Stock My Pond ahead of time for large orders and discounted prices. Call 501-676-3768 or go to stockmypond.com for more information. This entry was posted on Saturday, April 30th, 2016 at 12:36 am	and is filed under Events. You can follow any responses to this entry through the RSS 2.0 feed. Both comments and pings are currently closed.